As a “born and raised” resident of Washington, you’d think that I had spent a considerable amount of time at arguably the most beautiful natural wonder of the Pacific Northwest. Well, you’d be wrong. My parents tell me that we took a few trips to the mountain when I was very young and I vaguely remember a field trip or two, but I’ve spent the majority of my life taking in the beauty of Mount Rainier from a distance; waking up each morning to see the snow-capped peak on the horizon. After seeing this magnificent sight day in and day out for twenty-five years, you begin to take it for granted. 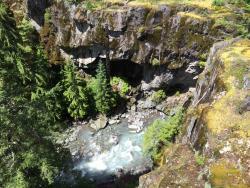 Needless to say, I’d been thinking about taking the trip to Mount Rainier National Park for some time. After thoroughly researching the park, I decided that Paradise would be the place to go. After all, Sunrise wasn’t open yet (it’s scheduled to open July 1) and with a name like Paradise, surely, it would be at least moderately breathtaking. 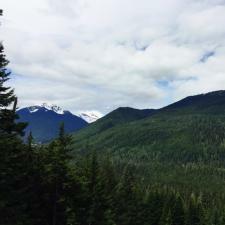 I wrangled up a couple of my buddies – who were like me in that they had lived in the Pacific Northwest their entire lives and neither had any memory of ever visiting Mount Rainier National Park – and we hopped in the car and started our journey. 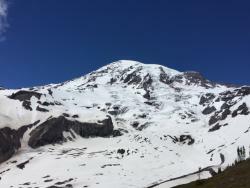 Geographically speaking, Mount Rainier is not far from Seattle Southside, but the drive is considerable. It took us about two hours to get to our final destination, not including a stop for breakfast. TIP #1: Leave early, between 7:00am-9:00am is best. If you can do a weekday, do it. We left on a Saturday morning a little later than we had planned (9:45am, thanks Kris), and the park was pretty busy. We still had a lot of trails to ourselves, but I can imagine how busy it will be later in the summer. There are a couple different routes to get to Paradise: South on I-5 and Route 7, or east on 164 or 169 and 410. Either way, you are circling the mountain and it will take around 2-2.5 hours. We went east on 169 (Maple Valley Highway) so that we could pass through Black Diamond and stop at the delicious, Black Diamond Bakery. A local favorite for over 100 years, if you can take this route, you must stop here. The restaurant has plenty of classic breakfast options with a great view of Rainier from the window. 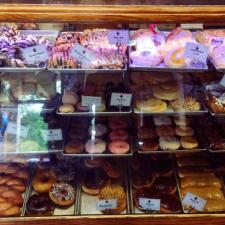 The bakery has a delectable assortment of donuts, cookies, cakes and Russian pretzels. TIP #2: Eat a hearty breakfast full of protein, not just donuts. Do as I say, not as I do. From the bakery, we were on our way to the mountain. The drive was dramatically scenic and we had to pull off the road a few times to take pictures. We drove through the small town of Green Water and discovered that they weren’t kidding. The river was emerald green. It was around this time that we started seeing snow along the sides of the road. Yep, it was late June and there was still plenty of compact snow on the ground (not on the road though, don’t worry about that). We drove through valleys and canyons along windy roads and cliff sides that had clearly just experienced a rock slide, but the views were breathtaking. TIP #3: Pull off at 1-3 viewpoints/waterfalls, but don’t spend all day there. There are so many amazing viewpoints along the way, but once you’re in the park itself, there’s no reason to look back. After passing through the park’s main entrance and paying the $25 fee for a single car (the pass is good for one week), we made our way to a rest stop at…I believe it was Box Canyon. We did a little exploring around the rest area and found a cliff side area with another beautiful view to sit and relax in the sun. Who would’ve thought that there would be such an amazing view fifty yards from a toilet? After our rest stop we drove for another twenty minutes until we passed the “Welcome to Paradise” sign and arrived at our destination. We grabbed our trusty CamelBaks filled with water and snacks and walked into the Henry M. Jackson Visitor Center. Inside, they had maps, food, restrooms, water, and an information center. There was an informative wall that had listed all the hikes at Paradise along with the difficulty levels and approximate roundtrip travel times. We decided on the Alta Vista trail that was listed as a “medium” difficulty with 1.75 hours of travel time, roundtrip. When we started our hike, we initially became a little worried that we would be stuck in a never-ending line of slow-moving, selfie-sticking tourists. But once the trails split, we found our independence and our space. It wasn’t long before we started seeing the wildlife…and snow. Yes, it was very early in the season so a lot of the trails were covered in snow. Even with the snow, we weren’t the least bit chilly. The sun would make an appearance every now and then; combine that with the level of activity and we were pretty toasty in t-shirts and shorts. TIP #4: If the sun is out, dress light, but come heavy with the water, hiking boots, sunglasses, hats, and SUNSCREEN. Learn from our mistakes, do not repeat them. It only took us about twenty-five minutes to get to the end of what we believed was the Alta Vista trail. Again, we traversed a lot of snow and it was oftentimes hard to discern where the trail was leading us and where the marmots wanted us to go so that they could steal our snack packs and give us the Ewoks on Endor treatment. We got to the end of the trail and we weren’t ready to head back, so we pressed on. Eventually, we met up with the strenuous Skyline trail and continued on towards the peak. I can’t tell you how many times we saw a landmark and said “that’ll be the end for us,” then continued on anyway. When we finally stopped, the clouds had cleared over the top of the mountain, giving us a spectacular view of the top and everything below. I can’t tell you how cool, crisp, and fresh the air was up there, and the pictures do not do the view justice. But I will tell you this…it was awesome. 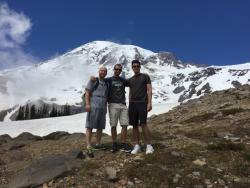 FINAL TIPS: Visit Mount Rainier National Park! Even if you don’t want to go all the way to Paradise or Sunrise, there are so many great hikes and scenic viewpoints along the way. Pull off to the side of the road and enjoy the fresh air, beautiful views, and fun hikes. Also, remember to bring sunglasses and sunscreen. Force Blake to drive you because he has a wicked-nice Subaru in case you run into any inclement weather. Don’t bring Kris unless you want to get hit by periodic snowballs even when you think you’re safe because you’re right next to a family with small children. 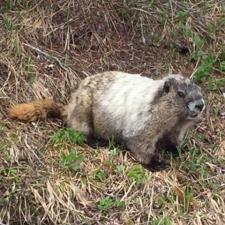 Finally, If the marmots kidnap you, their leader’s name is Borgar the Wise and he likes almonds. We visited the park early in the year and even though the wildflowers weren’t in full bloom and a lot of the trails were snow covered, it truly was the experience of a lifetime. We planned to return even before we reached Paradise, and with Sunrise opening July 1st, we want to try that side of the mountain as well. Until next time, Tahoma.